Arsenal & Chelsea Asia Tour @ Bukit Jalil. WHO WILL WIN?! 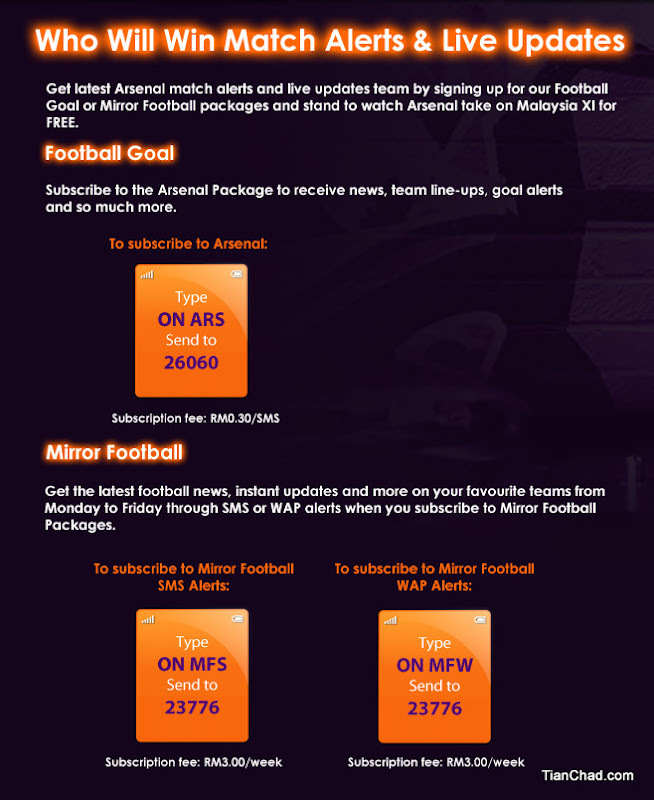 Guys, have you grabbed your chance to watch the Arsenal Asia Tour 2011 in Malaysia at National Stadium, Bukit Jalil earlier? Was it great? You can visit MiKeYip's website for photos of Arsenal FC vs Malaysia XI match. Do you know that you can actually watch the tour for FREE? Yes!! With Celcom Who Will Win Challenge you can actually watch both Arsenal asia Tour 2011 and Chelsea Football Club Tour 2011. If you've missed Arsenal match earlier. No worries as you still can grab your chance to watch Chelsea Football Team Tour at Malaysia Bukit Jalil Stadium. Celcom will be bringing these two matches to the fans and provide a rare opportunity for Arsenal FC and Chelsea FC fans to catch their favourite team live in action. All you have to do to get the Autographed jerseys and FREE tickets for each of the matches is by participating in the Celcom WHO WILL WIN challenge. ii. 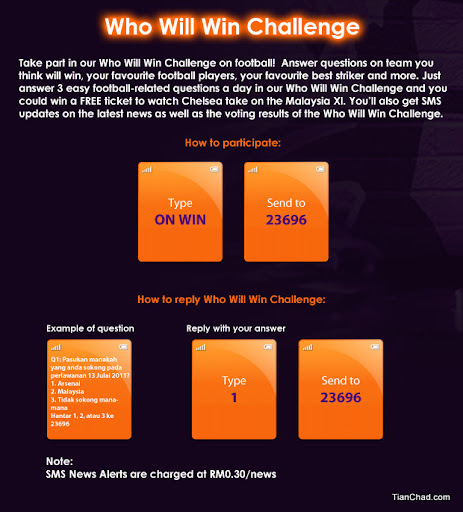 Receive 3 Questions per day (voting based) and SMS news alert. iii. Receive news alerts after you finish the questions. i. Dial *2299009 and answer 10 questions correctly. ii. After answering the last question, record your longest “goooooaaaaaaalllllll” cheer. iii. You will also receive a FREE Call-Me-Tones! 2. Receive your football club fan status as well as club activities and enjoy free chat together with premium downloads of your favorite football club. 2. After successfully downloading, answer a set of questions. Each set has five (5) SMS questions. You can answer a maximum of ten (10) sets of questions daily. 3. If you answer one (1) or more sets of question correctly, you will automatically be eligible for the prize selection. i. 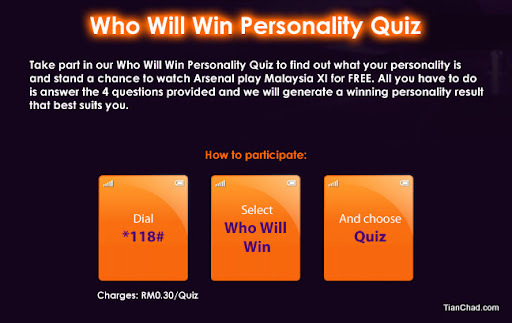 Join the personality quiz by dialing *118#, select Who Will Win and choose Quiz. ii. Answer all the questions given and you’ll receive your own personality result after answering all the questions. If answering question is not your strength, you can get the ticket and FREE Jersey through Who Will Win Music Downloads Challenge! 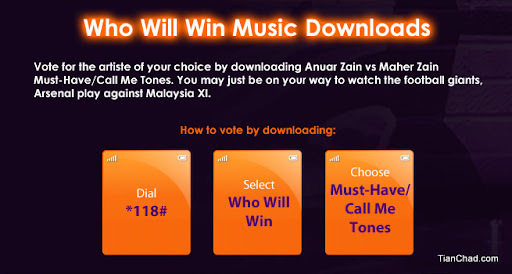 Download Who Will Win music by dialing *118#, choose Call Me Tones and select the Anuar Zain VS Maher Zain and download the music you like to be eligible to win the FREE tickets to the matches. For the ringtone list, visit here. For more information about Celcom WHO WILL WIN Challenge and how to win the tour ticket + autographed Jersey, visit Celcom ChannelX Who Will Win Promo page. If you are Arsenal fans click here. If you are Chelsea fans click here.